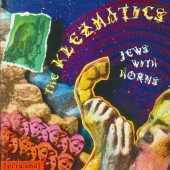 The Klezmatics - "Jews with Horns"
All good things come in three! Says Allen Ginsberg, after he'd had the pleasure to be backed up by them: Klezmatics are Classical and Pop avant Guard, exquisite professional musicians capable of quick study, sprightly brilliant tuneful funny outrageous and sweet . With Jews with Horns, their third release, the champions of New Klezmer are marching a good piece forward on their musical journey through the millennia. With illustrious guests (Marc Ribot, Chinito, Adrienne Cooper, BETTY, Moxy Früvous, etc.) and the production of Hijaz Hirsh-leyb Mustapha of 3Mustaphas3 fame: a piece of New Music fluorescing in infinite refraction - from Avantpop through Jazz to World Wild Music!